This paper studies the issue of applying working memory theory to redesign a mobile application information construction to improve the information delivery for the novices who have less design literature. The aim is to gain a graphic and words information design method and rules for handicraft self-learning page on mobile context. With the rapid development of China’s creative industry and motivation of a series of policies, a mass of novices rush into creative products design fields. They participate in competitions and exhibitions, but most of them lack basic knowledge and skills. Mobile application is considered a useful tool to help them begin. This research takes a handicraft self-learning page of a mobile application prototype as an example, which is included two kinds of visual information: graphics and words. 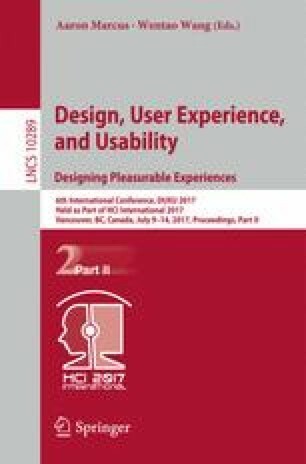 By explicating the relationship between working memory theory and user interface information design, stating the importance of using this theory, this research indicates that using working memory theory in user interface design has been aware of an everyday tool which designers can motivate the information delivery effectively and increase work performance. By using two main characters of working memory, limited capacity and volatile in mobile context, the research summarize principles for reconstruct the page wireframe and typography, redesign fronts, color and graphics. In the examination stage, researchers propose a hypothesis, comparing with the original page, participants’ handicraft process recognition and learning transfer had improved, time-costing of remembering the full page had reduced. A behavior experiment is used to verify the theory which raised in this research. 49 college students take part in this study as volunteers. Their ages vary from 18 to 23 with a mean age of 20.1 + 1.5 years. All of them have no experiences in doing handicraft. At the beginning of the experiment, a page of the mobile application is displayed to the volunteers who are required to remember the main processing steps of the handicraft which listed on the page. After a brevity rest, a redesigned page is shown to the volunteers which the same demands are required. Two factorials are measured in this experiment: (1) times of fully remembered processing steps which instructed on the application page;(2) how many steps could be recalled by volunteers after the fixed time. Those two factorials would be measured twice: one is after the original page displayed another one is after the redesigned page showed. These factorials could reveal that the effects of information delivering with one page of the mobile application, how much information could be delivered by a single page of the mobile application. The differences between the two measures would suggest that the effects of information transferring whether be improved after the page redesigning by using working memory theory. The results of this research suggest that both the total time of fully remembered steps and the steps could recall by volunteers after a fixed time have significant improvement after the redesigning. According to these results, we draw the conclusion that the mobile application page redesigning with the help of working memory theory could improve the recall of handicraft process obviously.